Wine, Cheese and Scrapbooking: What does Orchard mean? Today is a special day. Everyday has something special, so I usually think to myself that "today is a special day" even though there's nothing specific to celebrate or being happy about. It's just that everyday is special. One day you are here enjoying life, planning vacations, happily living and enjoying health... and the other day you are gone. So I hope I somehow has touched people I've met in my life. I hope those who love me and I love, know I've been trying to be the best I could under all circumstances. One is weak, one is human, one is imperfect. Let's face it, and let's embrace it. I took a moment (or two, LOL) today to make this card. I want to enter it in three challenges or sharing groups. One is the current Curtain Call Inspiration blog challenge for August 1, called Orchard. You can know more about it HERE. I had to look in the dictionary for the word "orchard" because the inspiration photo showed like a country scene with woods and apples but I didn't get it until read the definition. LOL English is my second language and some words we don't use regularly are not in our vocabulary. The other challenge is for Addicted to Stamps challenges and more, #156. It is an Anything Goes theme so I will enter this card there too. You can see the link HERE. And the third one is the next Friday Unity Friends with Flair linky. That is why the stamps used in this card are from Unity Stamp Co.
For the card I used a kraft cardstock base, then a slightly smaller cream base which I sprayed with red and green colors. Then I made a frame for the 3 colored apples in a chevron design paper, using red paper and black corrugated paper. The apples were stamped with distress inks. The inspiration photo for the Curtain Call challenge looks kind of distressed or vintage to me, so I thought stamping with these kind of ink would suit best. These are also placed with dimensional adhesives so they look really cool coming out from the card. Also added red fiber for a final touch. Hope you like my card. This one is very appropriate also for local seasonality. Classes start tomorrow here in Puerto Rico. Good luck to all the students, parents and teachers in this new academic year. Tks for stopping by and remember I love to read your comments. Leave your love. Fun card, and I love that fancy trim! A very autumnal card and a great take on the photo at CC. Love the vibrant colours and such great textures. 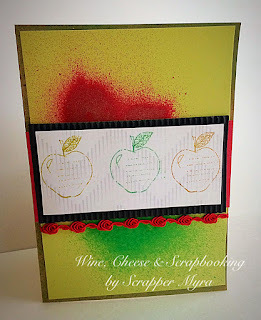 I love using apples on cards! The corrugated paper adds great texture to your card. Enjoy your day! Love the apples. Very pretty card. 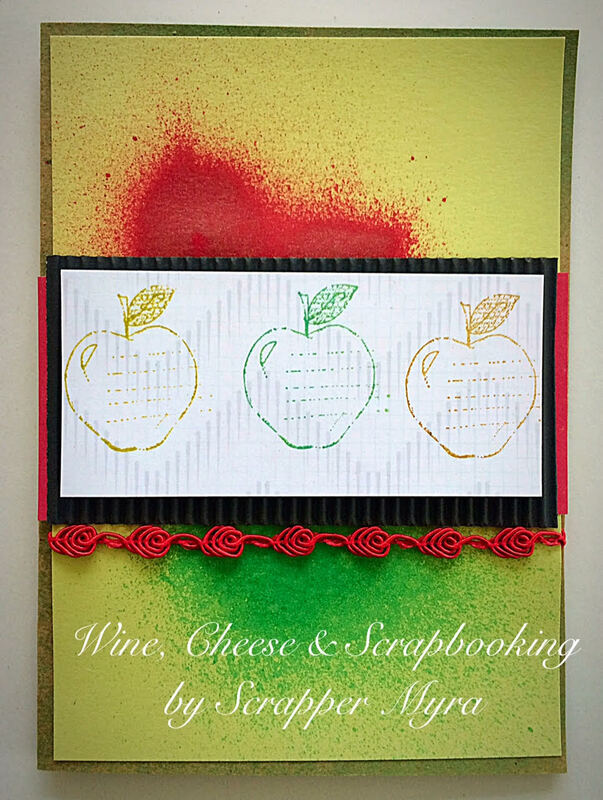 Awesome apple card,so delicious,sweet and inspirational; both your card and the apples.It really is a treat!